CoreLogic reported today that existing home sales prices officially recorded in October (probable contract average August) rose 6.3% year over year. Corelogic also collects MLS data on contract prices from which it calculates a pending home sales price index. 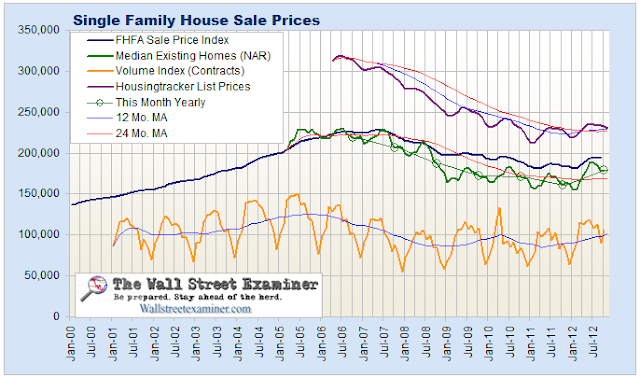 That index portends that closed sales in November will be up 7.1% year over year. These numbers are within the range of other recently reported US national housing price trend indicators. 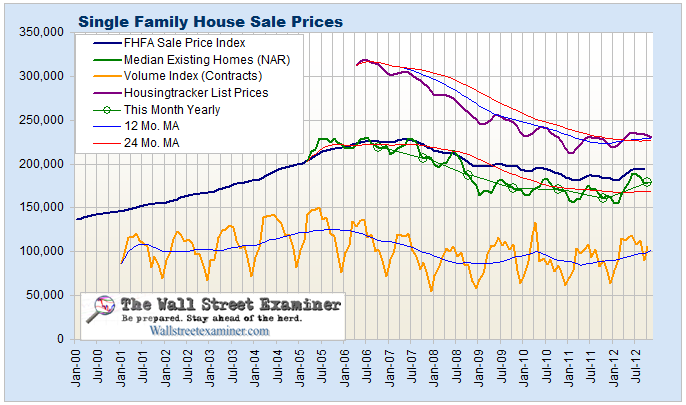 The following is an excerpt from the Wall Street Examiner Professional Edition Housing Report. In the current issue, I looked at a new indicator from the NAR that appears to be a decent proxy measure for supply and demand. The NAR publishes a survey of its members on their perception of buyer and seller traffic. Although no details are given regarding the methodology, the measure appears to be a diffusion index similar to other such industry surveys. What matters is not the absolute level, but the direction of the trend. As stock chartists, we would recognize the beginnings of a bullish trend with the uptick in buyer traffic from a higher low in late 2011 leading to a breakout in January 2012. That surge peaked in March, and has been stable since then. At the same time, seller traffic has continued to downtrend, making lower highs and lower lows. 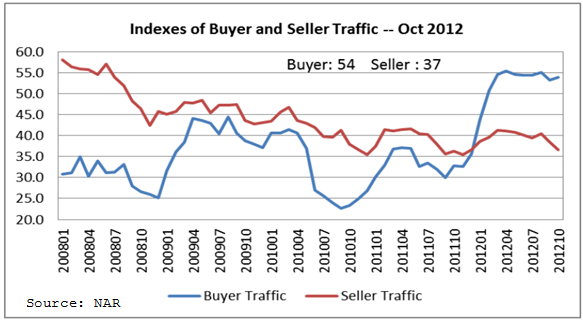 NAR Index of Buyer and Seller Traffic – Click to enlarge It’s not surprising that as long as buyer traffic remained below seller traffic, prices remained in a downtrend. The breakout in buyer traffic coincided with the absolute low in the NAR’s national median home price. Two months later, closed sale prices reflected the first surge in price off that low. Buyer traffic leveled off in April, and 2 months later so did prices, dropping since then in the usual seasonal second half decline. Seller traffic bears watching here. It’s in a position to make a higher low. If sellers return to the market in big enough numbers, that could put a lid on prices or at least slow the rate of growth. To that extent, this is an interesting indicator that can give us advance warning of any change in trend. Measures of Home Sale Prices- Click to enlarge The NAR’s data shows median sale price rising from a new low of $154,600 in January to $188,800 in June, where they reached a seasonal peak. Prices broke out from the 3 year base in June, and since have pulled back to the vicinity of the base. In the realm of technical analysis of price patterns, this is normal behavior for the initial stages of an uptrend.